Teen driver Shannon Carney, the daughter of writer Dan Carney, learns how to steer her way out of trouble at the BSR Accident Avoidance/Highway Safety course. Summer is typically the time when beginning drivers log their hours of behind-the-wheel training in driver's education courses so they can earn their licenses. Soon they’ll trek to the DMV, or maybe the courthouse, to pick up their freshly minted driving permits. But driving, like most activities, is a skill that improves both with experience and training, so while these new drivers think they are done with piloting a car under the watchful eyes of an instructor, they may just be ready to move on to graduate school. That’s the thinking of instructors at the BSR Accident Avoidance/Highway Safety course conducted at Summit Point Motorsports Park about an hour from Washington, D.C. And that’s why I sent my own teenage daughter to try the class, which mixes classroom instruction with on-track action. Other schools around the country conduct similar classes, and in fact our own Fairfax County (Virginia) police department offers teens a class with a similar curriculum. Other parents offered a variety of motivations for signing their kids up for the class, but mostly everyone wants to keep their young drivers safe. A mom said she believes it does. She enrolled her daughter in the course after the girl’s older brother took the class and as a result of what he learned avoided hitting a pair of skateboarders who skated through an intersection — against the light — directly in front of him the day after the class. Without the class’ preparation for emergency braking, he’d have killed the skateboarders, the boy told his mom. Many of the dads were car enthusiasts and former sports car racers who were already familiar with the track and had planned to bring their kids there to learn to drive since the day they were born. “I’ve been planning for her to do this since she was very young, ” remarked Wayne Burstein. “It is all about taking care of your kids, ” he continued. Of course, the racer dads figured they could teach their kids how to control the car themselves, but like Burstein, they recognized that kids listen to others better than to their parents in such situations. “This is about learning the muscle memory you can’t get in driver’s ed, ” he said. The class covers topics like basic vehicle control, braking at the limit of traction, braking while turning, recovering control of a car that has left the road, swerving to avoid obstacles in the road (like skateboarders! ), skid control and how to cope with loss of power steering and power brake assist. 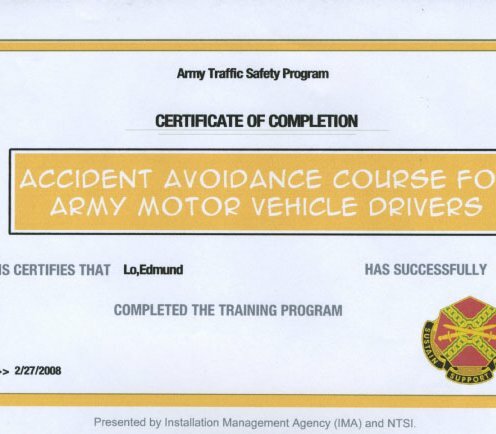 How long is Accident avoidance course good for?